Neither of us come from farming families, but we knew before we got married that supporting our family by farming was a goal we wanted to aim for. A lot of people told us it wasn't realistic, but Max had read too much about people who were doing it succesfully to be swayed by that well-intentioned discouragement. We initally thought that the time for farming would arrive after being married for a number of years, but that all changed when we took a 6 week road trip in the the summer of 2013. The trip included visiting 3 friends around the country who were all farming. 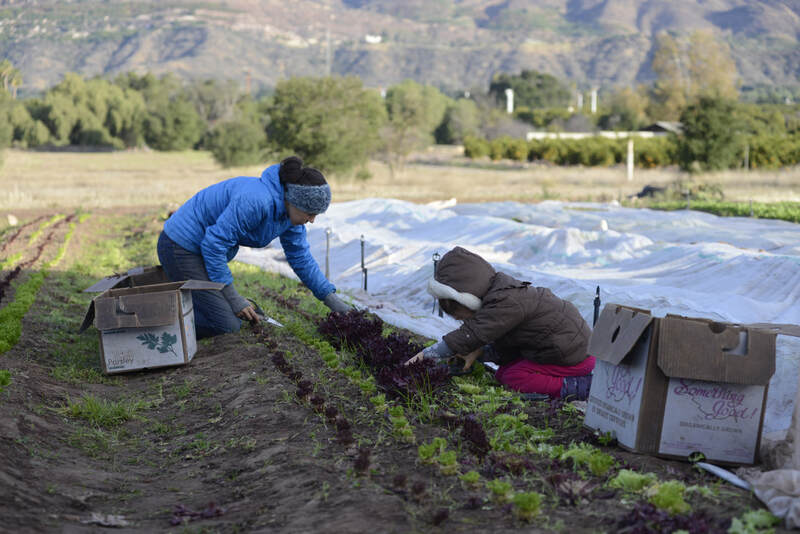 We got totally inspired to farm ourselves, so when we got back from the trip, Max decided to wake up to be at a local farm by 7:00 am for a volunteer session harvesting vegetables. He had a felxible work-from-home schedule, so he ended up volunteering regularly 3 days a week and worked for free to learn on a 12-acre organic veggie farm with a 60 member CSA. That continued for several months. Then toward the end of 2013, Max started noticing all the #2 produce that was wasted on the farm, and offered to try selling some of it for the farmer. He got to keep 50% of the money, since it would otherwise be thrown away, so we were making a little money doing it. 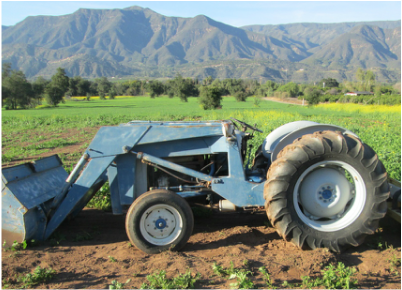 Eventually, the farmer let us offer his complete variety of produce to our small but growing customer list, and Ojai Valley Online Farmstand was born. As we write this in December 2016, we currently have almost 200 customers on our list and about 15 farms we source produce from. The Tractor that started the farm! In July 2014, Max saw an old 1964 Ford tractor for sale on the side of the road. Being the impulsive person he is, he bought it, with the logic that if he bought the tractor, then we would be forced to store it somewhere, and find land to lease for a farm. It worked! In November 2014, we signed a lease for one acre on an 80-acre ranch which used to be growing citrus, but the trees had all been taken out some years before. Max knew the family somewhat, and worked with one of their nephews ten years earlier in highschool to put a pumpkin patch on a different part of the same property. First Steps Farm was born! We actually started a blog at the time to document the early days of the farm, which you can read here, so we won't go into all the details here. ​Earlier that summer, we had bought a small Microgreens business from a friend who started it while in college, but was moving away after graduation. We bought all his equipment, and took over a couple accounts he had with local restaurants. We had it set up in our front yard and driveway, and were making a couple hundred dollars a week out of our tiny yard by the time we got the farm. We put up a small greenhouse right before the winter night-time temps began to drop, and moved them all out to the farm. Deirdre was very happy to see all the equipment leave the house and go out to our new leased property! 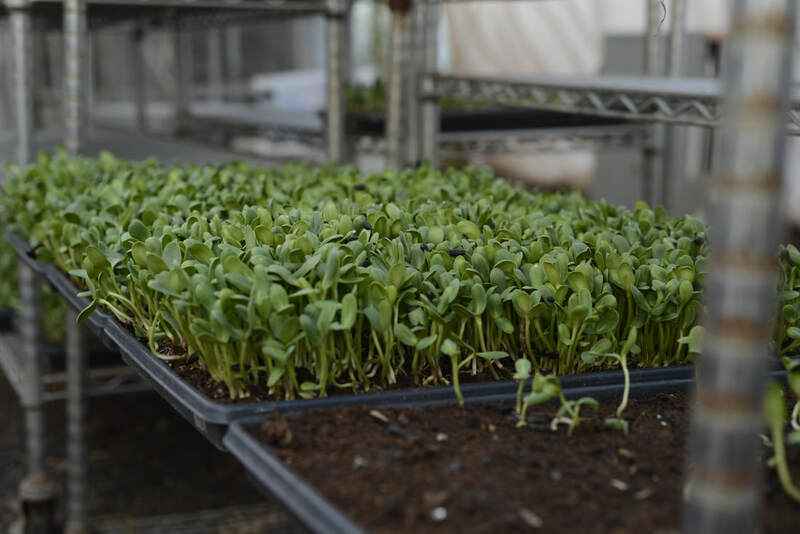 Between the online farmstand sales, and the microgreen sales, we already had cash flow when we hit the ground from day one, and this helped a lot. We didn't have to wait several months for plants to grow before making our first money. We had also started some lettuce transplants at our house, so we had some plants ready to go into the ground quickly. Our first two crops were lettuce and spinach, planted on Thankgiving day 2014. Our first two crops, lettuce and spinach. 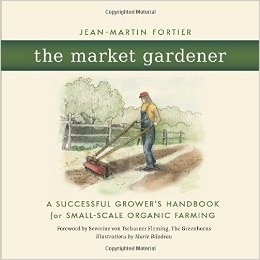 At the time we signed the lease, Max was buying a bunch of books on organic farming, but one stood out above all the others -- the Market Gardener by Jean-Martin Fortier. Jean-Martin and his wife Maude-Helene farm 2 acres in Quebec, and make an impressive $150,000 in annual sales during their 9 month growing season. Ironically, this book convinced us to farm without a tractor, so our old Ford 4000 quickly became obsolete. Well, at least it got us moving and helped us get the property! Following Jean-Martin's model, we made a small investment in an Italian BCS 853 walking tractor, and two attachments. We also bought hand tools and a precision seeder recommended by the book. Apart from the microgreens, we modeled our farm almost identically to theirs. Jean-Martin using a BCS 853 Italian walking tractor with a rotary power harrow attached. We bought both new for ourselves -- two of the best purchases we ever made for the farm. ​In April 2015, Max made the big step to stop working for his old graduate school, which he had been doing from home, with about 1 week of travelling per month. He had already reduced the number of hours he worked for them, but now we cut it off completely. Deirdre was still teaching music and dance lessons, but from that point on, all our money has come from our various businesses. It has not been easy, but cutting ourselves off from outside employment has forced us to become more efficient. Over the next few years we grew a variety of vegetables, focusing primarily on lettuce and arugula. 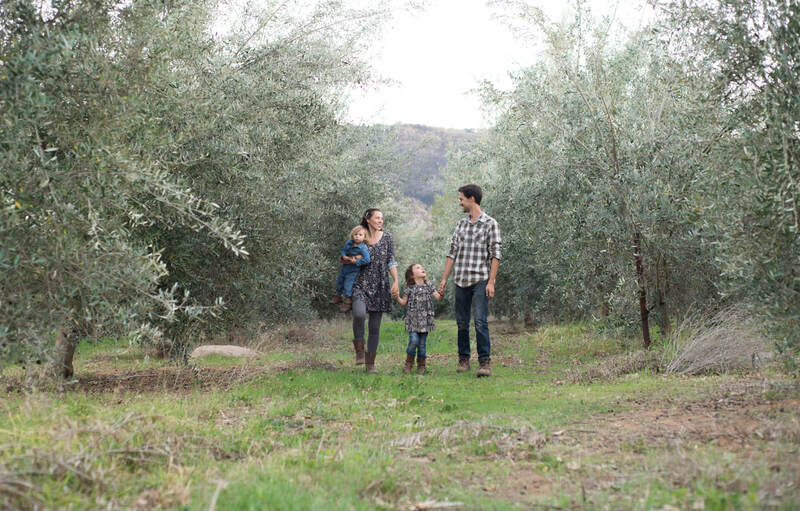 In 2017, we added 5 acres to the farm by leasing a separate site with 825 olive trees growing on it. We raised olives for oil and broiler chickens in between the trees. Our orchard barely escaped being burned by the Thomas Fire of December 2017. Around the same time we took a trip to Maine and felt inspired to consider moving our family there. It was a crazy idea, especially after all the effort of starting and building our farm in CA. In the end, we did decide to move, and that is where the story now stands. We begin a new chapter in Maine, and this post here describes why we are taking a short break from farming. Follow the blog to read what comes next! Lots, really. First Steps Farm? Why did we choose that name? 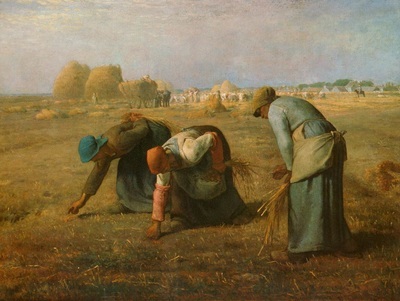 It all started with seeing a copy of Jean-Francois Millet's famous painting, "The First Steps." 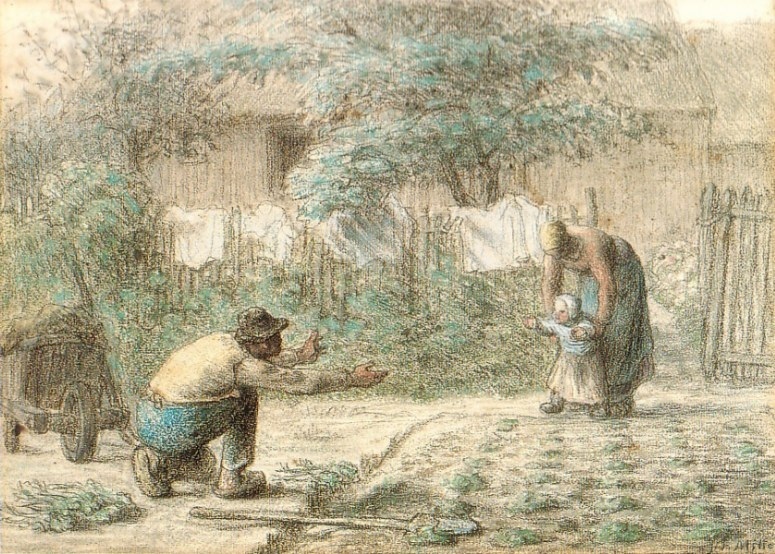 The picture (see above) depicts a gardener stopping his work to hold out his arms for his young daughter. 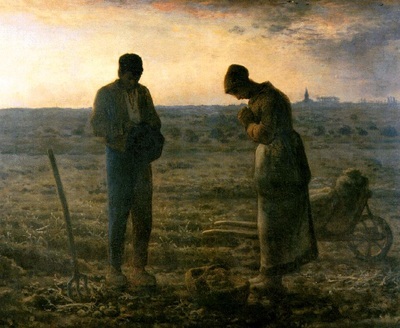 The gardener's wife is supporting the child as she leans forward to show her dad that she can take a step by herself. The careful support of the mother, combined with the enthusiastic gesture of the father reveal to the viewer this is a new, exciting accomplishment in the child's life. The picture has many subtle implications, which are relevant to us and our mission. Millet was a French artist of the 19th century, who often chose everyday pastoral scenes from the French countryside for his paintings. The bio-intensive method we use on our farm rose out of a rich tradition of French gardeners, trying to make the most of limited (usually urban) space for growing vegetables. 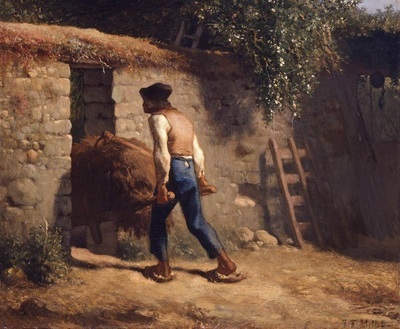 This tradition reached a peak in the 2nd half of the 19th century, when Parisian gardeners supplied the city with much of it's produce by growing within the city bounds. Today in the 21st century, we have the opportunity to take this tradition to a whole new scale with amazing tools designed for the market gardener. France is also the source of the world's finest culinary tradition, which has grown to be the standard reference point for the training of chefs. The culinary arts are the flowering perfection of the garden's products, and it is not surprising that to see such a strong tradition in both fields come from the same country. When prepared with love, care, detail and skill, food has a strong social power to unite people in fellowship. Karen von Blixen's story "Babette's Feast" illustrates this beautifully. We are grateful beneficiaries of the culinary tradition, and see it as a vital component to the social function of our farm's product. 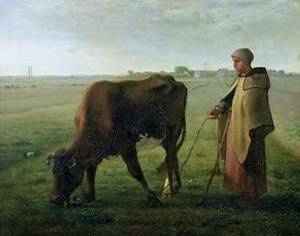 The scene is one of a family: father, mother and child. Family is very important to us, because it is in our families that we learn our most fundamental values. Being a value-driven farm, rather than exclusively profit-driven farm, we see the important role families have to play in forming the values of the next generation of society. There are many integral human values that can be learned on a farm, such as hard work, team work, patience, self-denial, gratitude for the earth's bounty, and recognition of creation's beauty. 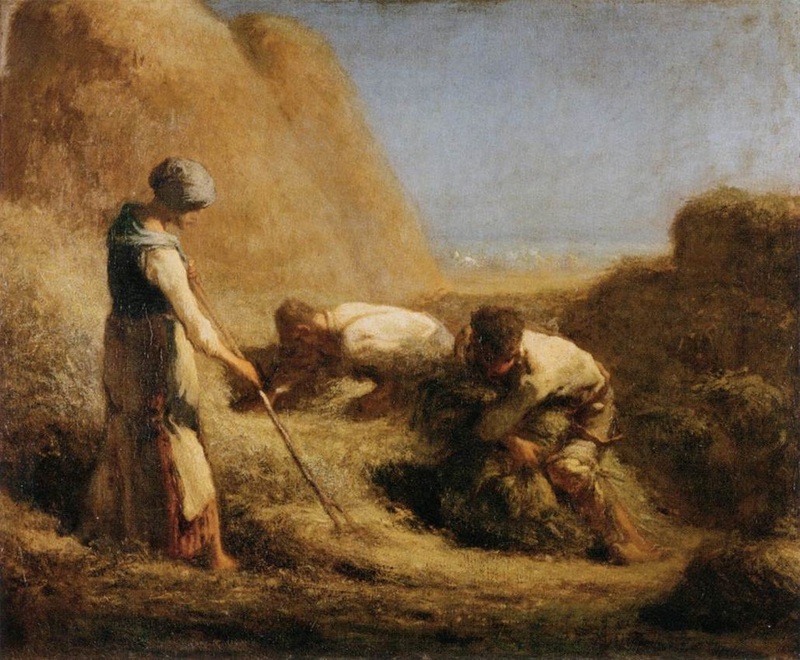 The proverbial "Family Farm" is a school in life and virtue for a young child. If we want to see a new generation of entrepreneurial, ecological farmers, it all starts with strong families rooted in the land. Our hope is that we can be the soil for those roots to grow. 6. The Title "First Steps"
Part of what captured us about this painting is the title. So much so that we took it for our own! We ourselves are taking our first steps as farmers. Although we both come from strong home gardening backgrounds, neither of us come from families that ran working farms. Our return to the land was a conscious move, and one that requires us to learn as we go, take one "first step" at a time. We want to facilitate others, especially our children, to take their first steps farming. Our children may choose other ways in life, but we want them all to realize that they can support themselves by farming if they choose, and by doing so support others by providing them food. We also hope to be a resource for other families or individuals who want to begin their own farms. This is an exciting time for the small farmer. 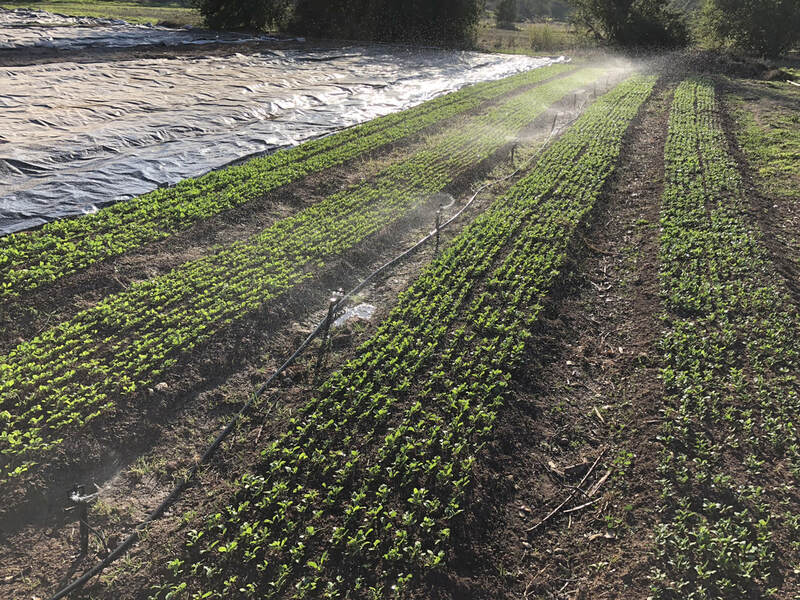 Growing consumer awareness of quality food, together with an explosion in information, tools and technology tailored to highly efficient small scale farming is preparing the social and economic ground for a renaissance in small farms. 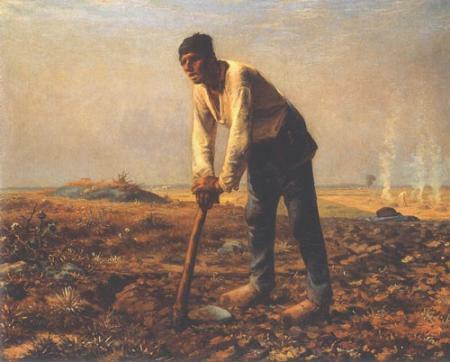 Part of this renaissance is providing small farmers with resources to make a decent living at their profession. When one realizes the average age for US farmers is around 60, the next 10-20 years will be an exciting time for a new farming generation coming on the scene. Society is taking it's "first steps" toward a small farm renaissance as we begin our own farm.